All of the welding and fabrication of brackets and fixings for the Bantam have been done by Derek. Many of the new parts have been robustly and often ingeniously made from stainless steel. Derek is also an active member of the VMCC. The donor D14 engine needs a large bore exhaust system. Ours was manufactured by TJ Wassell of Cannock, Staffs, UK for Bournemouth Bantams. A simple mounting bracket was made to secure the exhaust to the D1. The exhuast flange nut and clip came from Bournemouth Bantams too. Bantam chains were originally 1/2" pitch, 0.335" roller diameter, 0.205" inside width. These are now very hard to come by. Sprockets Unlimtied supplied me with new alloy sprockets to fit a more readily available chain size; 1/2" pitch, 0.305" roller diameter, 0.25" inside width. The gearbox sprocket has 16 teeth and the rear has 48. To hold the battery, Derek fabricated a robust stainless steel carrier lined with rubber. We mounted the box as low down and as far forward as possible on the bike, securing it top, bottom and rear-facing side with stainless brackets. (To be painted). The line of the new D14/4 silencer runs straight through the location of the off-side footrest. Derek made a bracket from steel steam pipe for the exhaust to pass through. The footrest bar was welded onto both sides of the pipe. The D1 front forks are simple and somewhat frail. They suffered quite badly on my first journey in 2009. Bantam Owners Club member, Pete Rose of Southport, spent his New Years Day holiday restoring them. They now work perfectly thanks to Pete and the helpful support network provided by the Owners Club. 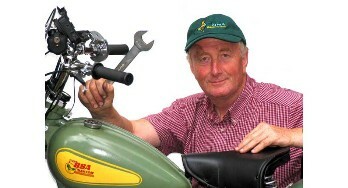 Derek fitted a pair of pannier frames off an AJS to help me secure my luggage to the bike. He made stainless brackets to mount it under the saddle springs, to the Bantam's existing rear carrier (2 each side) and to the rear of the muduguard stays. Note also the location of the Scotoiler inside of the nearside pannier frame. A sidestand was invaluable on my ride to India, but during the course of the journey it bent under the load. We used a new Indian Royal Enfield sidestand for the Bantam that Derek cut and welded to shape and secured to the bike with a robust bracket. (To be painted). Derek fitted a stainless steel headlamp grill to protect the headlamp lens from stones. The grill was a 7" car item that he cut down and spot-welded into a new, smaller stainless outer. 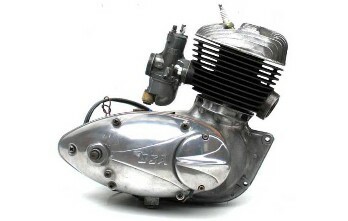 Much as it would be great to use the original 125cc 3-speed D1 engine for the journey, it would be too impracticable. Getting over the Alps and Dolomites fully laden would be a challenge and a half! We are fitting a 1969 175cc D14 / 4 Bantam engine, anticipating that the extra horsepower and 4th gear will make the journey more enjoyable. Please see Engine Rebuild page for more information.